This is parts 3 and 4 of Rewarding Outcomes from Pushing Your Comfort Limits. Read parts 1 and 2. Part III: The Heartache a.k.a. Why Can Nothing Ever Go Right!? Machined turn signal switch housing. 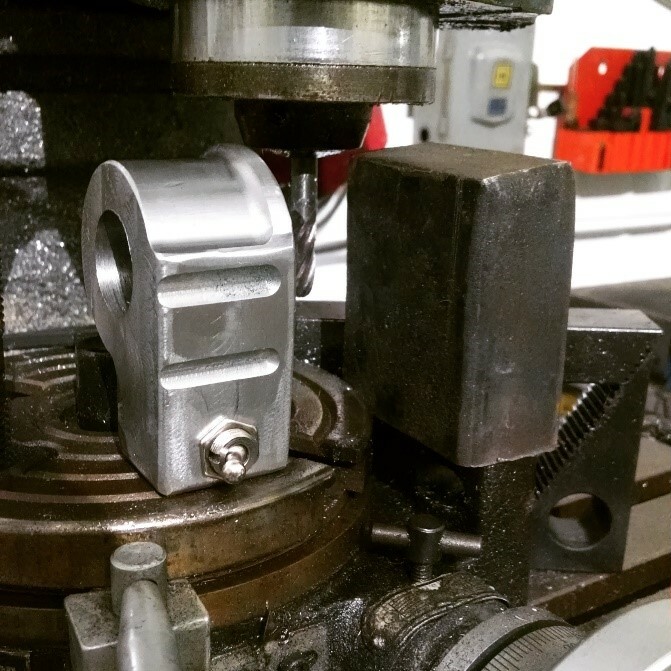 The switch housing starts as a 2″ thick block of solid steel. Two weeks earlier my buddy Angelo loaned me his Harley just in case something like this happened. I had it sitting in my trailer. But it wouldn’t be the same. I decided, in my stubbornness, that if I couldn’t ride my own bike that I built in Sturgis then there was no point in going. This was quite similar to a small toddler throwing a temper tantrum. Dejected and sulking in my failure, I stared at a 99 percent complete motorcycle reflecting on how close I was and all the nights of lost sleep. All for nothing, it seemed. Then, when all hope seemed lost, my support network kicked in. Kate called me with the solution that saved the trip: “Go ask the Speed Shop for help.” The Speed Shop to which she referred was Albany Speed Shop. They were my neighbors. They are top-notch auto mechanics that have been in the industry for over 30 years. They don’t really focus on motorcycles, so it didn’t occur to me to ask them. With no options left, I walked out of my shop and into theirs and laid out my situation. “Oh, we’ve got a tool for that,” Harrold told me. Using his $300 specialty tool, I was able to fix my snapped brake line, and was back in the game. My noon deadline came and went, but I didn’t care. 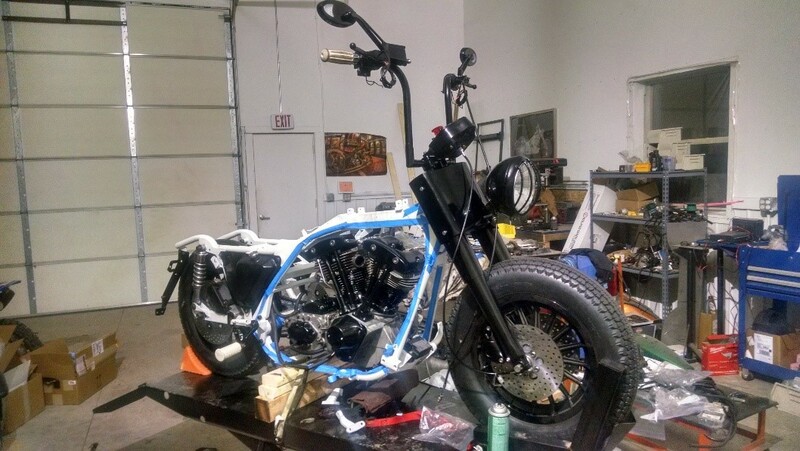 I still had a chance to finish my bike and get to Sturgis by Sunday. I worked through the afternoon, and into the early evening. Around 7:30 PM on the 31st Kate came to the shop and I told her I was ready to fire up the bike for the first time. Before (top) and after (bottom) of my 1982 Harley Davidson shovelhead, ready for my trip to Sturgis. After getting a few hours of sleep, the issue was so clear to me that it woke me out of a sound sleep. Revitalized and refreshed after 5 hours of sleep, I went to work and watched the sunrise for the 2nd day in a row from my shop window. Shortly after 6:30 a.m., I turned the ignition on, took a deep breath, said a short prayer to every G(g)od from every different religion, and hit the starter button. The bike fired instantly. My heart raced. I threw my helmet on, and took the bike down the road. All of the drama, heartache, and failure that I experienced over the past few months melted away as soon as the wind hit my face. I texted the crew: “Never mind all that stuff I said before. See you guys in 24 hours.” I went home, packed my bag, grabbed Kate, loaded the bike on the trailer, and hit the road. Sturgis bound. This is called a map. Before smart phones, people used these artifacts to find their way and plan their routes. This was our preferred method of planning since we didn’t want to take any direct routes. We opted for scenic routes and roads less travelled. Sturgis is far. I mean, hundreds of miles of bland scenery and nothingness that give way to…hundreds more miles of more bland scenery. From Albany to Sturgis is roughly 1,750 miles. To put that in perspective, to go from London, England to Berlin, Germany is only 680 miles. From London to Madrid, Spain is only 1,068 miles. London to Rome (in case you’re curious) is only 1,158 miles. A good equivalent would be driving from London to Moscow, Russia, which is about 1,780 miles. So what’s my point? Our country is quite large, and I-90 West is quite boring. That’s all. Kate and I took turns driving my truck with a 14’ trailer in tow. 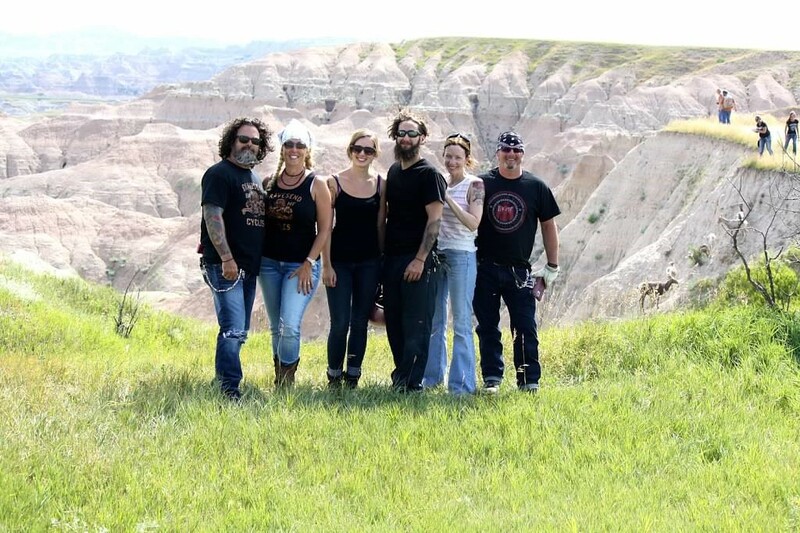 The two couples we were meeting in Sturgis both rode there from Long Island, New York. 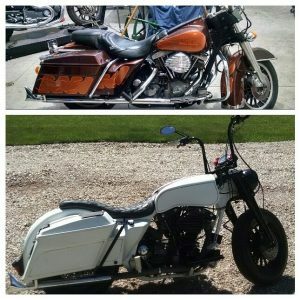 Both guys turned 50 in 2015, and on their bucket list was to ride to Sturgis. This was the year they did it. Kate and I volunteered to drive my truck and trailer with everyone’s luggage, my bike, and an extra bike just in case something went wrong. 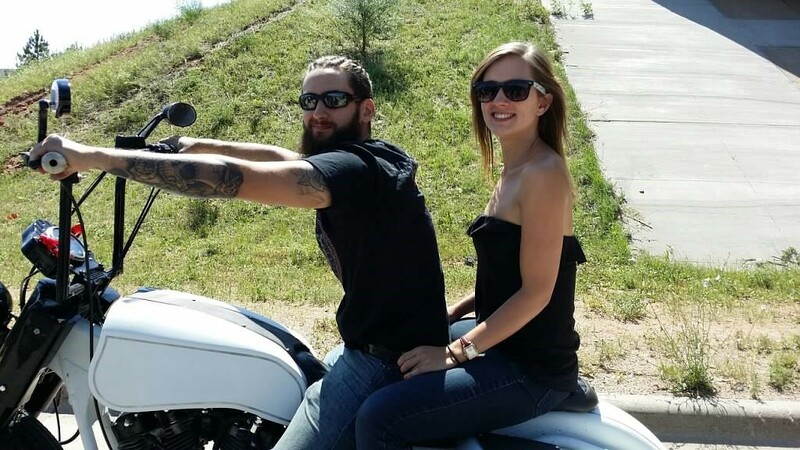 We drove straight through, and after leaving at around 3:00 p.m. on Saturday, August 1st, we rolled up to our rented house in the Black Hills of Sturgis, South Dakota at 11:00 p.m. on Sunday, August 2nd. Riding through the Black Hills. Monday morning, we woke up and hit the road. This time on two wheels. Our plan was to ride each day to a new destination. Overall, we rode another 600 miles from Monday to Thursday, before heading back to New York on Friday. I will try to describe some of the highlights below, but there are no words that can compare to the actual experience. Unlike being in a car, train, or airplane, riding a motorcycle puts you closer to the world around you. It is raw and honest. You can feel and hear every mechanical operation taking place below you. You can smell and taste the air as it rushes by your face. When you go over the peak of a hill, your stomach drops for a moment as your bike suddenly points downward, like when you were a kid on a roller coaster. I’ll rely mostly on pictures to tell the story because I was always more of a fan of picture books, anyways. Our group in the Badlands. (left to right) Copper Mike, Deb, Kate, me, Diane, and Angelo. This was our first day’s ride. 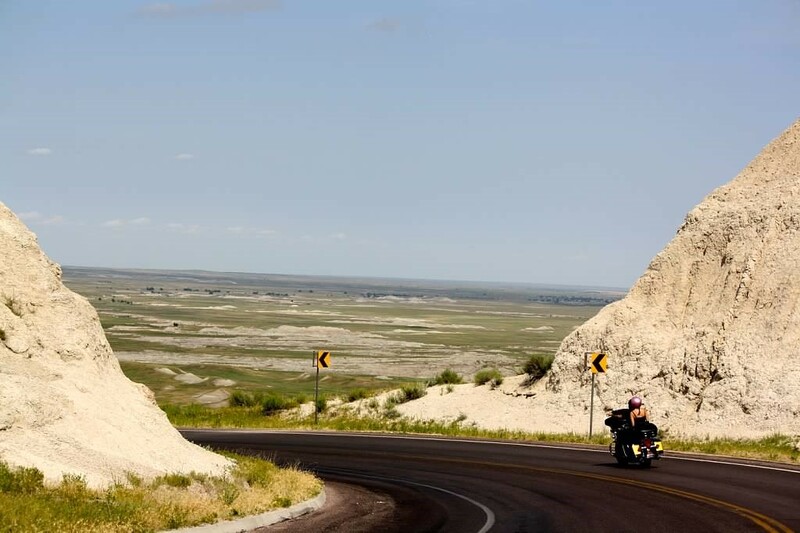 The Badlands was a little over 100 miles outside of where we were staying in Sturgis. The beauty of staying in the Black Hills was that there was only one road into or out of the Hills. One way went into Sturgis and the other went through historic Deadwood. 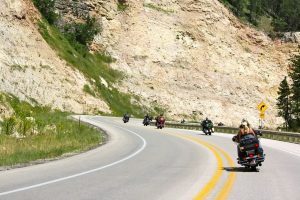 Every day when we set out, we rode through Deadwood and through the scenic, turning, undulating hills of South Dakota. Through Deadwood, the back roads of the Black Hills, and eventually back onto I-90 (my favorite road), and we finally found ourselves at The Badlands. I often heard people say how breathtaking this sight was, but it exceeded expectations. If you find yourself in South Dakota with time to do one thing and only one thing, go to the Badlands! Riding my Sturgis build, named Into the Mystic, through Sturgis. The first viewing stop along Needles Highway. Over that wooden rail it goes straight down onto rocks. This was my favorite part of the trip. While I love being on two wheels, the truth is that I strongly dislike heights. When you’re in a car and you’re on a bridge, you often have a false sense of security. When you’re on a bike, there’s no illusion of your elevation or vulnerability. When they said we were going to ride down Needles Highway, my immediate urge was to back out. 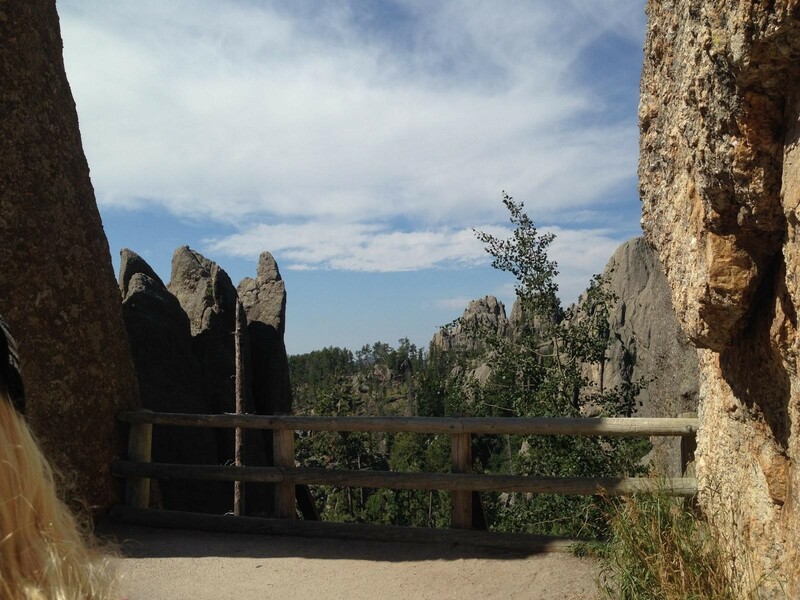 Needles Highway is known for its switchback turns, one-way tunnels, and sheer cliff drops if you go off the road. It’s that last part that made me uneasy. All of the sudden, maybe I had a stomachache, headache, or any other type of ache that meant I could stay away from the narrow highway with steep drop offs. Then it dawned on me that this is why I came to South Dakota, and why I worked so hard. When I pushed my comfort limit, I was rewarded tenfold. The experience of riding Needles Highway is unlike any other riding I’ve done. For anyone that rides, I recommend it as a must-do, if you haven’t already. What’s the moral of my story? I never claimed to be Aesop or deliver any deep meaning. All I can convey is my own experience. I get used to my daily routines, the roads I travel, and that which I know. I, like many others, develop my comfort zone. What took place over the course of this build (and every build) was that I came up against what seemed like insurmountable obstacles. Every time that I lost faith, someone in my support network pushed me, believed in me, and gave me the strength to keep going. Whether it was finishing the build, making the 1,750 mile drive, or riding down Needles Highway, the unavoidable truth was that each time I challenged my comfort level, I grew. The direct result of this growth is the unwavering confidence that I garnered to take on similar situations in the future. Life is a ride filled with switchback turns and sheer face drop offs. Enjoy each moment of it. Left: Our buffalo friend who appeared on the side of the road to Custer State Park. Interesting note: I always thought that buffalo were just like big cows. Incorrect – they are more like bulls on anabolic steroids. Center: The one-way tunnel to start Needles Highway. We didn’t get many pictures of the switchbacks and steep drops due to uncontrollable sweating and need to control the motorcycle. Right: Kate and I at Mt. Rushmore. That bike is quite a beauty. Congratulations on the build.